Winters in Berlin have been pretty sedate compared to our first winter in Germany, which met our incoming flight from California - complete with piles of suitcases and a dog in a crate - with -15C temperatures and an absolute dumping of snow. I haven't experienced anything close again until this month. The weather gods answered our wishes for a white Christmas a few weeks late with -20C windchill and turned Berlin into a magical winter wonderland, for a few days, at least. Not sure if this temps this winter will dip that low again, but once is enough to jolt most into reconsidering their winter wardrobe. After going from spending Christmas biking along the Pacific without so much as a winter coat, to managing regular dog walks in temperatures that make my lungs burn with frostbite, I've spent several years honing what keeps out the cold. 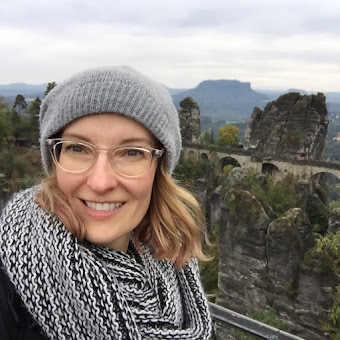 Since making more friends who are new to Berlin or hail from places like Australia, which is pretty much California-down-under (just with scarier wildlife), I figured it was time to share what I've learned about keeping warm - and keeping all your digits - in a new and more diverse climate. Base layers| When the temperatures get below 0C (or in my case, anything in the single digits), base layers become a necessary part of getting dressed. I've tried silk, cotton, wool and synthetic and I have definite favorites. For years, I swore by Smartwool mid-weight bottoms. They are heavy-duty cold defenders, but do have the downside of being a little bulkier than most underthings and the wool can be a bit irritating if you have sensitive skin. Then I discovered Uniqlo's Extra Warm Heattech and winter life as I knew it was changed. The regular Heattech is fine and good for chilly days (like autumn), but the Extra Warm stuff is no joke, even on the coldest of Berlin days. The added bonus: it's super soft, plush and non-irritating. This year, it also came in a large range of tops as well. Stock up, my friend! Warm accessories | Winter accessories are key in keeping warm. Good hats, scarves and gloves are essentially the cherry, sprinkles and whipped cream on top of your cold-weather sundae: without them, it's just not the same. I swear by this cashmere hat from COS (I have it in two colors, with hopes of collecting the whole assortment) because it's super warm, yet thin enough to put in your bag or even stuff in a coat pocket if you get too toasty. Double-layer hats, fleece-lined especially, are also a good idea for extra frigid days when you'll be out in the cold a lot. I don't care if losing 50% of your body heat through your head is really a myth, it feels true. Scarves might be my favorite invention of all time, especially on days so cold that your first breath outdoors threatens to shut down your lungs. A scarf that not only covers your neck, but your mouth and nose as well, can be a total lifesaver. My rule of thumb here: Bigger is better, both in thickness of material and area covered. Something in lush wool like & Other Stories oversized scarf, or my go-to, J.Crew's brushed Italian wool scarf, are great for piling over your face and using your own warm breath to your advantage. Find wool scarves irritating or out of your budget? Zara never fails to make several acrylic ones each year that can double as blankets and keep out cold just as well as the high-end stuff. Last but certainly not least in the accessories department: Gloves. Some people might say 'but that's what pockets are for! ', but they clearly haven't yet hit a patch of sidewalk black ice and tumbled face-first into the pavement because their hands were stuck in... you guessed it, their pockets. In this day and age, let's be honest, they can't just warm your hands, they've gotta be functional too (read: let you keep being your super-productive Instagram/Snapchat/Twitter-self while keeping your fingers from going numb). I find Muji's touchscreen gloves do the job nicely and are priced so well - especially at half-off, as they are now - it's easy to pick up several pairs in anticipation of the ones you'll inevitably drop en route somewhere. I will admit, these babies don't hold up in the frigid temps like what we experienced last week, but it's easy to have them on under a pair of proper snow gloves or my favorite, fleece-lined knit gloves, and slip out of them to access your phone without exposing bare skin to arctic air. Warm wool socks | In my book, this is a big one. One that can make or break you having feeling in your toes after going outside. This is also an area where you get what you pay for. The good ones are expensive, but can you really put a price tag on finishing up winter with your toes still intact? A few years back, I discovered Wigwam socks (out of the U.S.) and ever since, these have been the gold standard for winter footwear. They are like having your feet wrapped in the cushiest, warmest blanket all day. Falke trekking socks are also very good, and easier to come by in Deutschland, though not quite as plush. Insulated boots | During the pseudo-Death Freeze the other week, I saw people walking around with sneakers and one girl even with bare ankles, which made me go into hypothermic shock just looking at them (though the sliver of opening between my hat and giant scarf, of course). I don't know who these people are with amazing internal heaters, but I am most certainly not one of them. Don't even get me started about what happens when the snow turns to slush. Warm, dry feet and happy feet and insulated - and waterproof - boots are a must. Being the shoe girl that I am, I'm pretty particular that my winter footwear isn't only functional, but looks good too. Turns out to be a tall order, as most winter boots are terribly ugly, or at least feel terribly out of place trekking around a city in what looks better suited to an Antarctic expedition. If you can manage to invest in the good stuff, I can't recommend UGGs and Cougar Boots enough. Some disclaimers: By UGGs, I DO NOT mean the elephant feet kind, because (1) those offer no protection from water whatsoever, and (2) they fall into ugly territory. I mean the real leather, waterproof (or at the very least, water repellent) boots that look like they pass for real shoes. I swear by my Broome IIs, which are sadly discontinued, but the UGG Thomsen is very similar in style and insulation factor. Cougar Boots hail from Canada and are honestly hard to come by outside its own great Northern territory. I've found some here and there in the U.S., but it's hit or miss. Like UGGs, you can also venture into unfortunate-looking territory with these, but there are always a couple pair each year that can pass for moderately stylish, like these Cougar Bang boots. Those Canadians clearly know what they are doing. My plush-lined pair is even warmer than my proper North Face snow-trekking boots, if that gives you an idea. Portable warmth | When you need that extra bit of heat when out for a long day in the cold, something warm for your pockets is a much-appreciated extra. Standing out in the cold waiting for a tram or trekking through a park or forest means extremities get real cold, real fast. These handy (excuse the pun) hand-warmers from L.L.Bean are just the thing for those frigid days when your body temperature could use the extra boost. I've also seen what are essentially little hot water bottles for your pockets, but nothing beats these for ease and flexibility. Go forth into winter, and have warm hands! While a winter coat is a given, the type and budget are so varied, that I leave that up to you. You can go with a simple wool number and layer the heck out of it, or choose a waterproof, heavy duty parka and be set no matter what Death Freeze decides to rear its ugly head. I have everything from Italian-made stadium cloth from J.Crew to an inexpensive snow parka from Lands End snagged on super sale, and it all keeps me warm mostly depending on these other factors here. OK, OK, the snow parka would probably keep me warm even if I were naked underneath, but you get my point. A solid coat is a must, but it's really these other details that keep you toasty overall. Also worth noting: Many people swear by artificial sun lamps to help keep their spirits up during the long, dark winter that can lead even those with the most sunny dispositions into the depths of depression, but I have yet to try one myself (I've found hitting the gym to be a great mood booster). If anyone has any recommendations on this, please share your experiences in the comments!